What Is the Flex Point in a Golf Shaft? 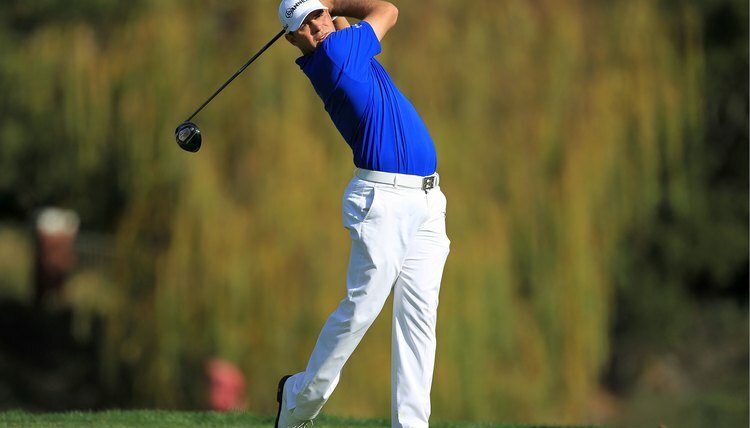 A power player with a fast swing speed such as PGA Tour player Gary Woodland needs a higher flex point to help keep his shots under control. Clubfitters take a lot of familiar things into account when fitting you for clubs. Some of these – such as the lie of the clubs, size of the grips and, to some degree, the loft of the clubs – can be adjusted after you buy the clubs. Other things have to determined before you buy the clubs – such as the shaft material (steel or graphite), type of flex (regular, stiff, etc.) and length. But golfers also are fit for a less familiar specification – the shaft flex point. When you swing your club, the shaft bends or "loads" to store power. It then straightens or "unloads" to release that power and help create clubhead speed. The flex point, also called the kick point, is the spot on the shaft where most of that bending takes place. The kick point is important because it helps determine the ball's trajectory after you hit it. Your shaft can have a high, medium or low kick point. The general rule for kick points is an inverse relationship. That means that the higher the kick point is on the shaft, the lower the ball flight will be. A low kick point gives you a higher ball flight and a medium kick point gives you a medium ball flight. The kick point doesn't work alone. Your ball flight is the result of several interrelated factors. The most important is your swing speed, which dictates the club's loft, the shaft flex and the shaft's kick point, among other things. Your fitter starts with your swing speed because swing speed determines how high you need to hit the ball if you want to hit it a long way. If you have a slow swing speed, you need to get the ball up quicker for a higher launch angle. Your fitter generally will give you clubs with more loft, softer shafts and a lower kick point. The extra loft puts more backspin on the ball so it starts on a higher trajectory; the softer shaft stores more energy; and the low kick point releases the shaft energy quicker. To understand this concept, think of slapping something; your wrist moves your hand very quickly on a sharper arc. If you have a fast swing speed, you don't have a problem getting the ball up in the air. You need more control in your swing. Your fitter will fit you for less loft, stiffer shafts and a higher kick point. Less loft means less backspin (and a lower trajectory); the stiffer shafts dampen the energy in the shaft; and the higher kick point releases that energy more slowly. Rather than a slapping action, the high kick point is more of a sweeping motion.